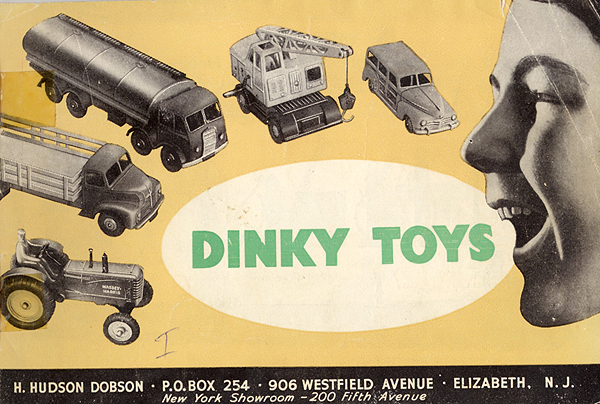 I think overall I am more a fan of the spun wheel, probably because they were introduced about the time I was entrusted to buy my own Dinkys with pocket money rather than get them as presents. 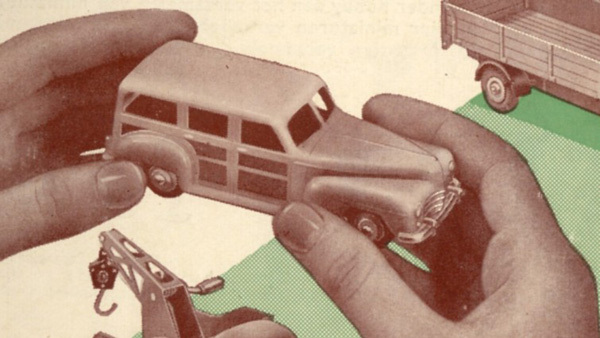 I lusted after the cadillac 131, but even shop soiled without a box couldn't afford one (settling for a similar condition Capstan van instead - probably worth more now!). 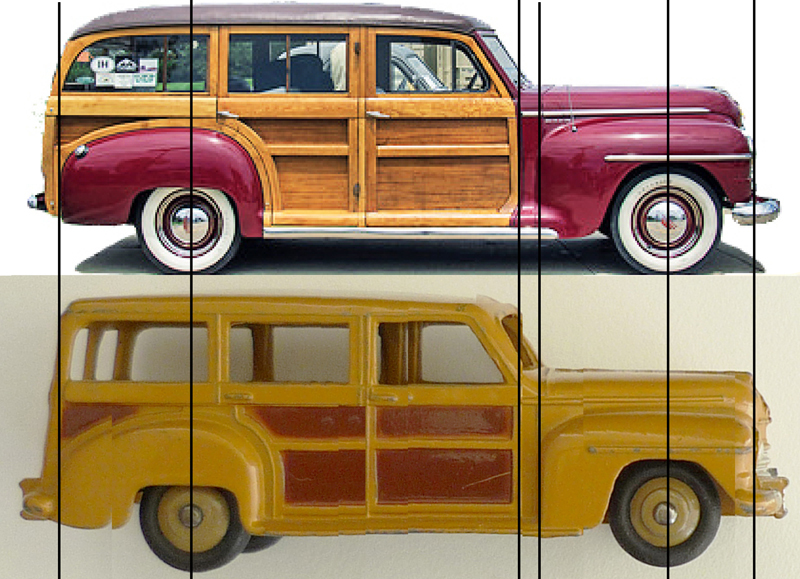 As former Sec of the Woodie Car Club, I attach a photo of my Plymouth Estate cars. 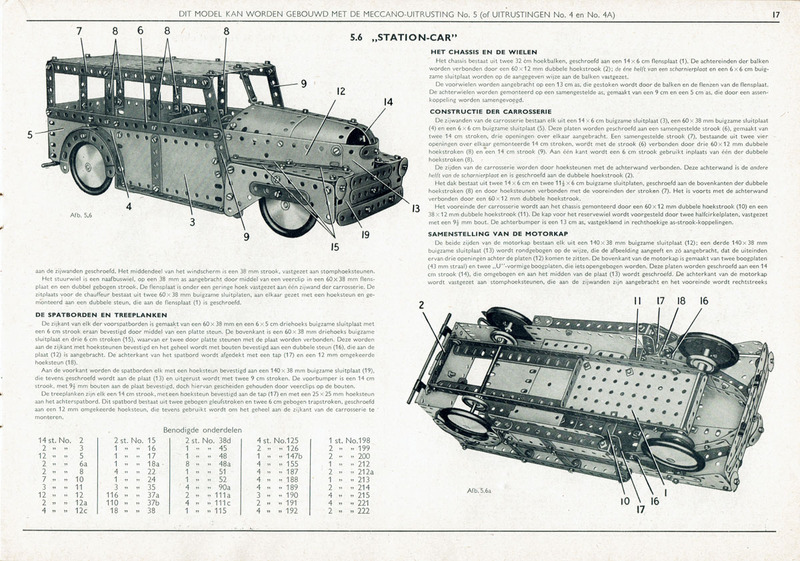 The Meccano one is built to contemporary Meccano plans but unlike the Dinky has the embellishment of a rear mounted spare. I was amazed about the silver painting of your Estate Cars in your contribution above and was also amazed that you did not get any reaction to the silver painting of the left Estate car on the photos. I will explain my late response to your contribution. 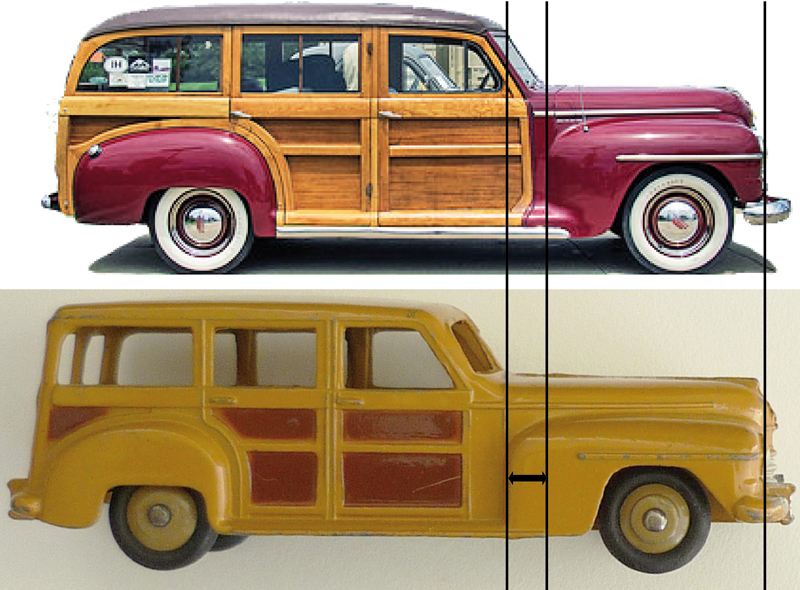 I am looking for a variation of the Estate Car and for orientation I have read all comments about this model in TMT and DTCA and looked up many photos. 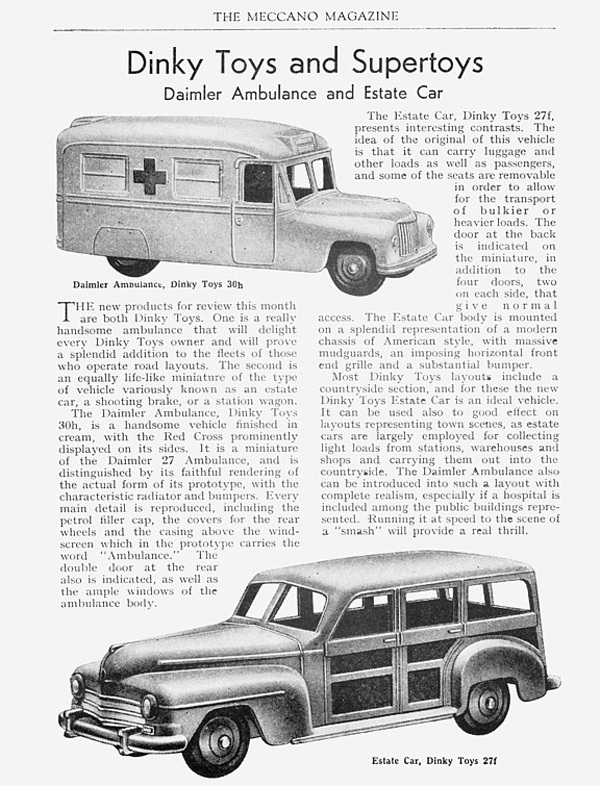 I came across pictures of your Estate Cars in TMT concerning a comparison between the front and rear of your 2 different Plymouth Estate Cars of which the front sides are also shown in your contribution above. 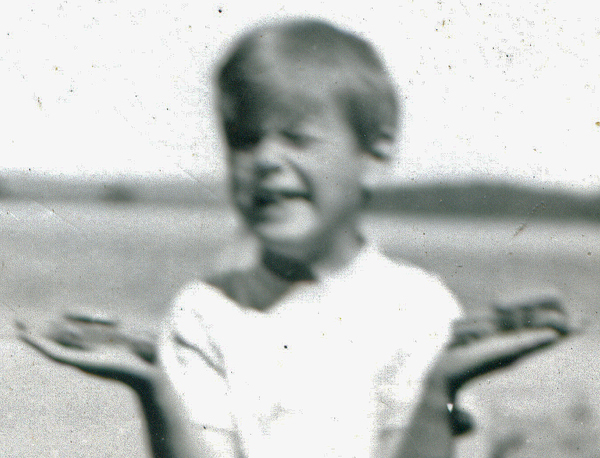 On the right an early and on the left a later one. It is well known that you only want to collect factory original models and critical pay attention to all details of models you want to collect. I was therefore amazed about the silver painting of your left model that I have not found on other same models. For a good understanding I show your images of TMT again in this contribution and add also images of my own (mint) later Estate Car with spun hubs to compare. Of your left one the front badge and ornament of the decorative strip at the top of the hood are also painted silver and I have not found this on other same models. To my knowledge, front bumpers, grilles and headlights are painted silver, using masks. As far as I can judge, I can hardly believe that these upper ornaments are included in the mask spraying, because I don’t see this in the series of same models. I think that these are hand painted, but not in the factory. The silver painting at the rear does not seem to me as a Paint Job from Meccano Liverpool because I have not seen this in a series of other same models. Your left model is a later 344 with cream hubs. I own the model, directly issued after that, with spun hubs. If the silver painting of your left model is an original Paint Job from Meccano Liverpool then my later model with spun hubs should also have this silver painting, but that is not the case and I do not see it on other same models either. My Dinky Toys 344 Estate Car with spun hubs - silver painting front. 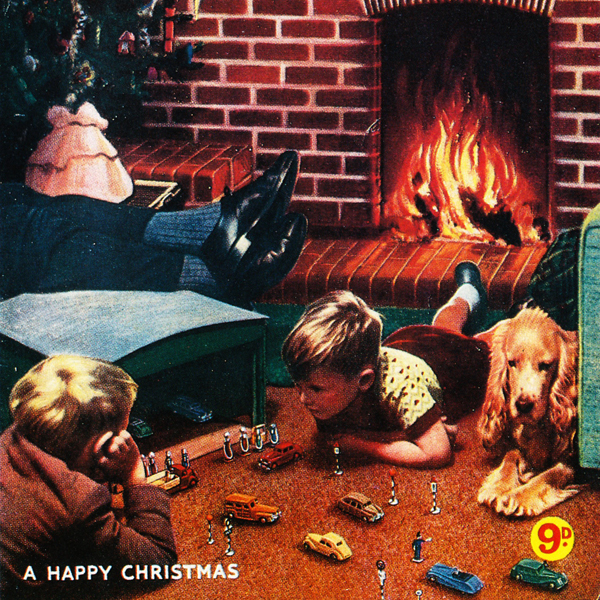 No silver painting of hood ornaments. Note the die wear between the hood ornaments. 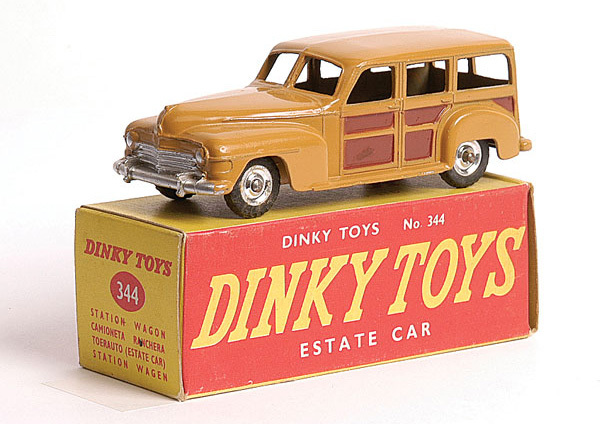 My Dinky Toys 344 Estate Car with spun hubs - no silver painting rear bumpers. Note the not accurate mask painting (spraying) trough painting the door style. A sloppiness of Meccano Liverpool. My Dinky Toys 344 Estate Car with spun hubs - left side view. 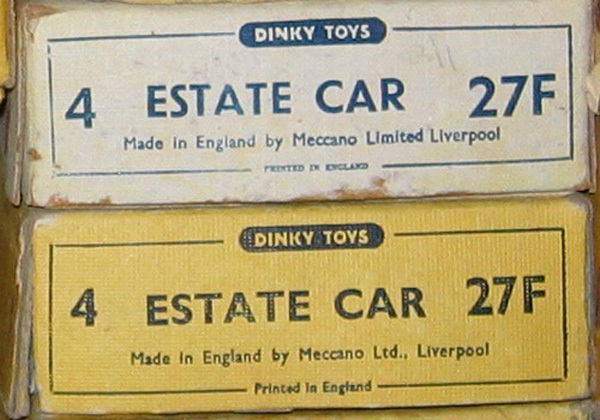 My Dinky Toys 344 Estate Car with spun hubs – glossy base plate. Nigel Mynheer does also not speak about such a variation with silver painted rear bumpers and silver painted hood ornaments in his article in model collector of October 2001. His statement is as follow: Front bumper, vertical bar grille and headlights are highlighted in silver. 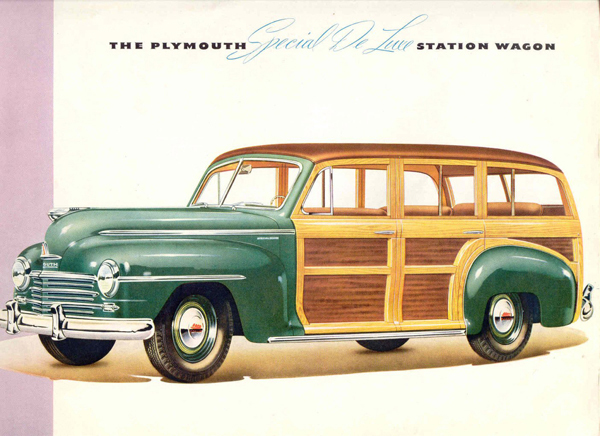 Moulded details include front wing trim-lines, bonnet spears, Plymouth badge, door handles and window frames. This clearly supports my way of thinking. In conclusion, I personally believe that the silver painting on the rear bumpers and hood ornaments of the left one is not original factory painted and must have been hand painted through the previous owner. This is possible, because as you stated in your contribution, you bought this model yourself later on, about 37 years ago. I hope you will understand my contribution and want to respond how you think about this. Kind regards, Jan O. 26-2-2018. Jan. Thank you for your response and your explanation of how you see this. Still, I want to say something about that. 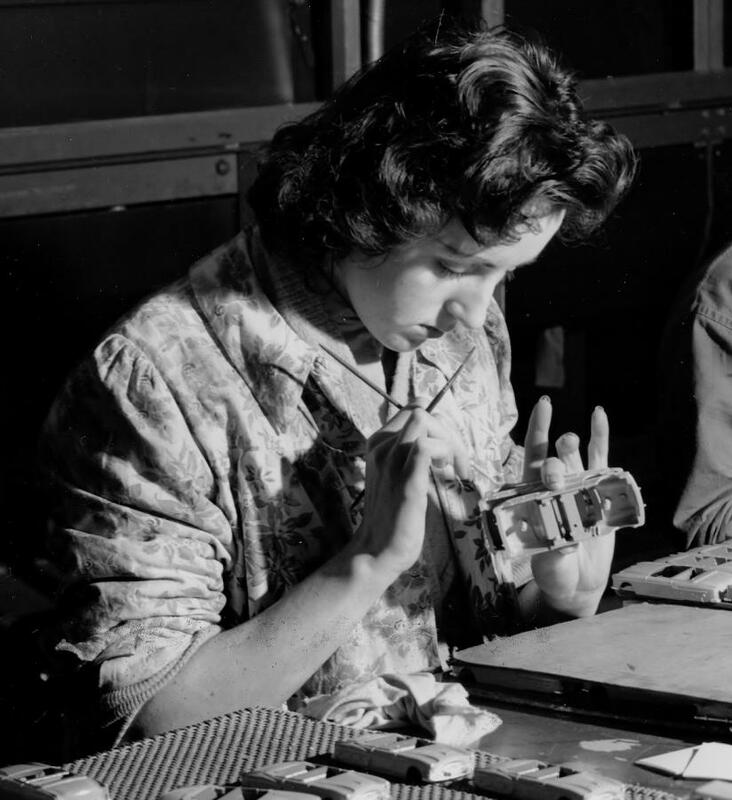 Of course you are also looking for an explanation for this unusual silver painting and do you think this was done by the ladies of the Touch up department, which I can hardly believe, because this does not seem logical in this special case. I do not think the ladies of the Touch up department deviate from their assignment. 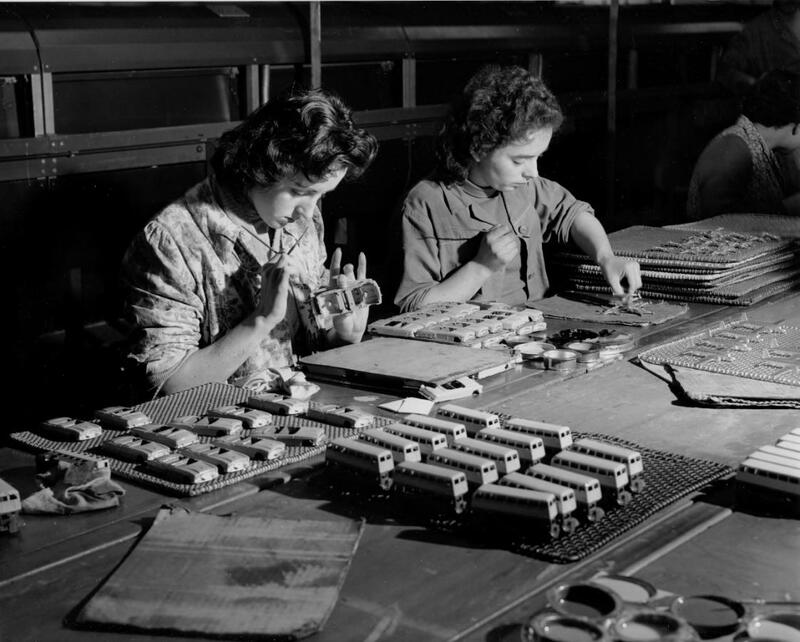 They know their responsibility and must comply with the factory instructions. There is no room for freedom from individual actions and beautification of individual models according to their own insight. That can cost their job. Certainly the silver painting of the rear bumpers of this model, which (very strange) of this model absolutely should not have been done in the factory at all, it seems unlikely to me that there is one lady of the Touch up department who only for this individual model deviates from her assignment and risk to loose her job. For me it remains only the other option... Unfortunately, I don't know, how to say it in other words and hope you will understand that. Keep moving. Kind regards, Jan O. 27-2-2018. 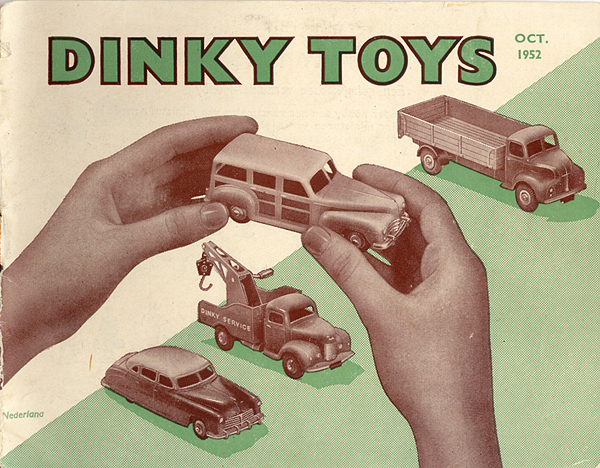 A very nice review of this popular Dinky......it was also an early favorite of mine. 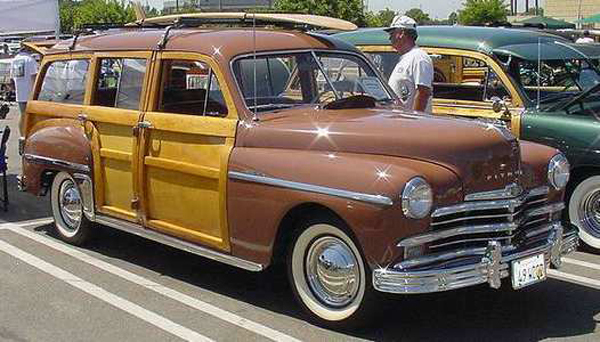 Many American car manufacturers made similar, wood bodied estate cars (station wagons here in the US), up until the early 1950's, and these are now very collectible today and command high prices. 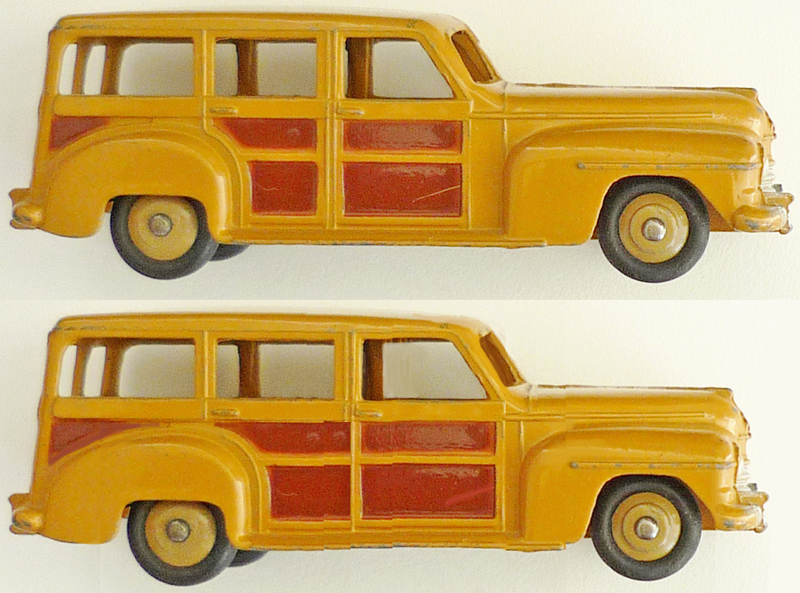 Dinky made a very nice model of the Plymouth wagon, although the rear roof area slopes down on the real car. 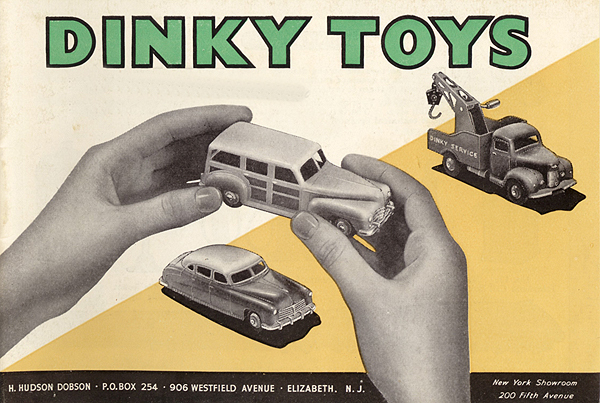 It certainly appeared in a lot of early catalog covers and ads. 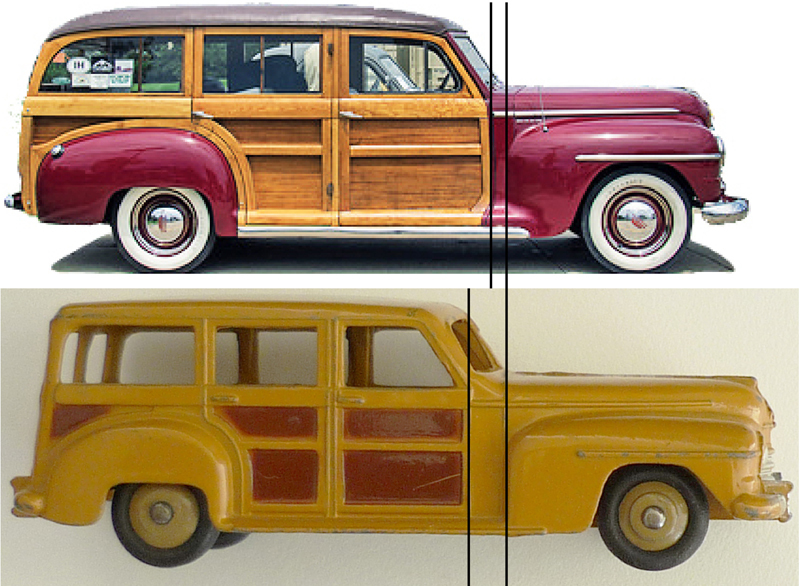 Always a puzzling model to me, and one I ignored, even if now I'd like one in my collection. 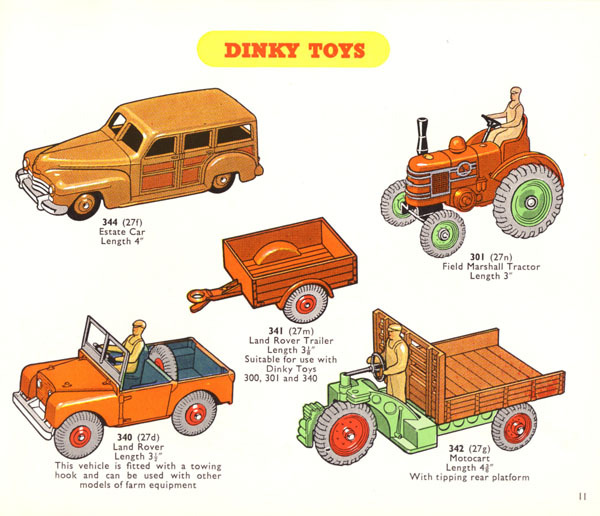 i wonder why Dinky never acknowledged that this is a Plymouth, and why it relegated the vehicle to being a "farm" model (neither accurate nor appealing to suburban boys such as myself). P.S. 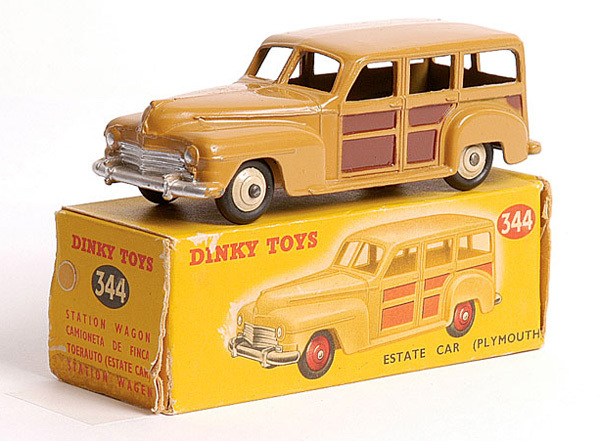 Oops, I see from some of the boxes about that Dinky did belatedly admit to the model being a Plymouth, but why so half-hearted? 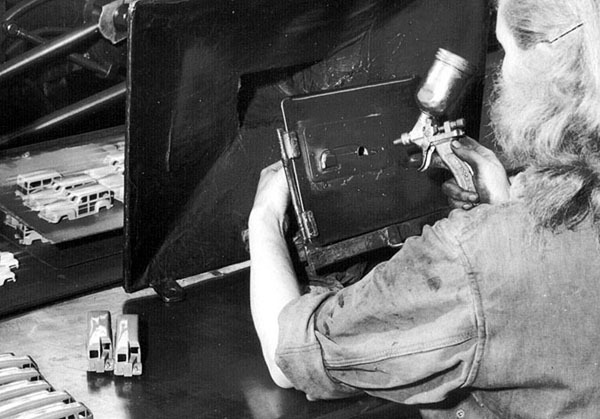 An initial falling out with the auto manufacturer? I am guessing that the reason Meccano assigned this station wagon to the farm segment is that the English perception of station wagons or estate cars, as they knew them, was likely somewhat different from that in the US, where they were used as suburban vehicles, capable of carrying several passengers as well as oversized cargo, and not relegated to the farm.....where pickup trucks have always ruled. 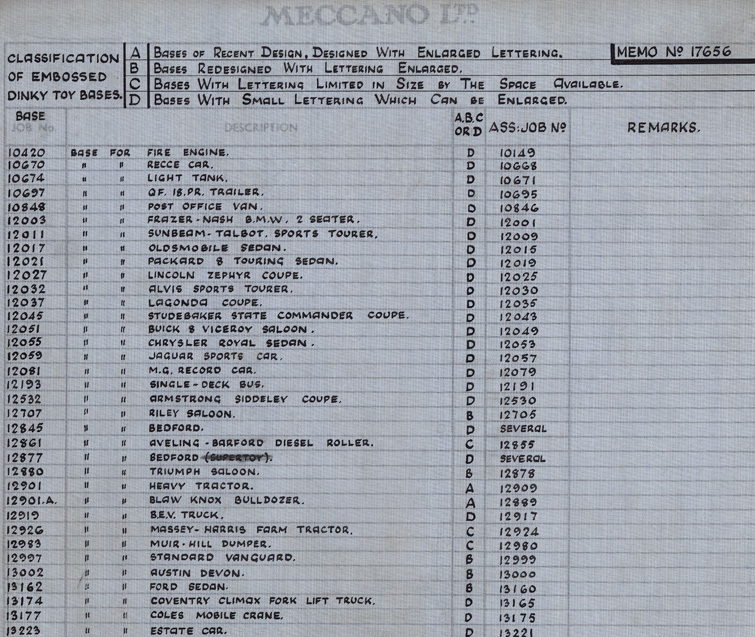 As to why it wasn't prominently labeled a Plymouth, that will likely remain a mystery......an oddity for sure! But, like Jan, that didn't stop me as a youngster wanting one, and still liking it today. 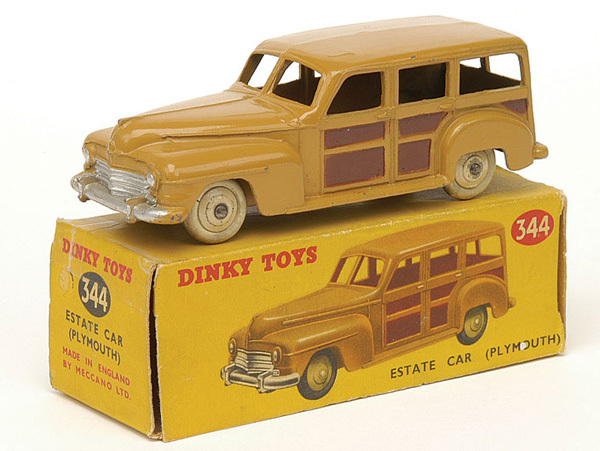 There is something fishy about this Plymouth by Dinky! 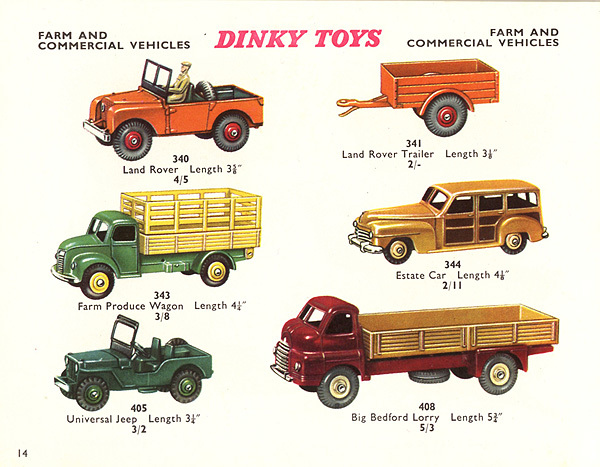 Not only doesn’t the Dinky ”boxy” design of the rear part of the body exist in any literature. The only version I have seen is the body with the rounded ending of the roof that also seems to be the standard factory coachwork. 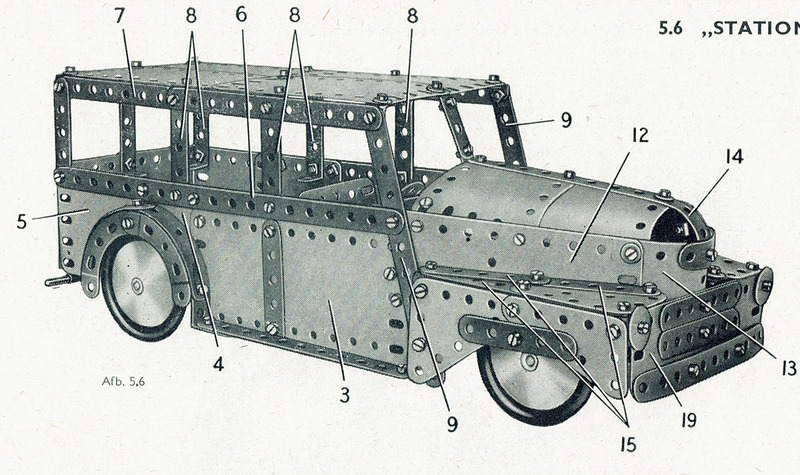 Where did the Dinky design team find this coachwork? 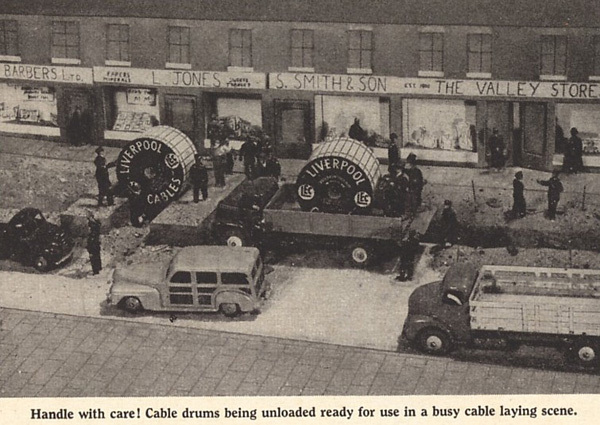 Is it locally built in Britain (not unusual at the time, I think)? 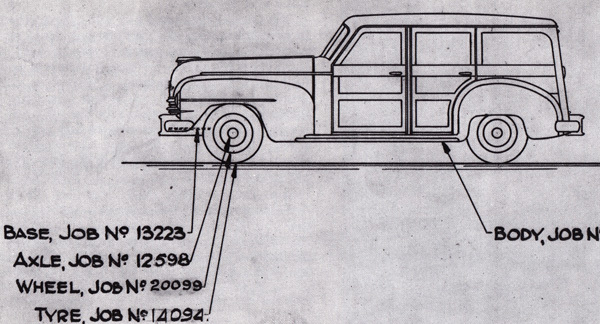 The other odd things are the dimensions of the front parts. 1. 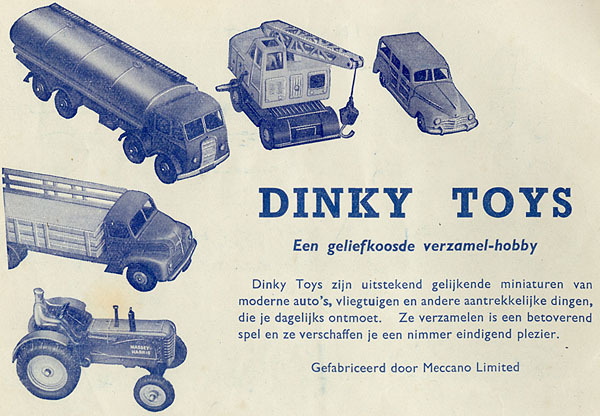 Why did Dinky prolong the front fender/wing? 2. Why did they prolong the distance between the front door and the front fender/wing? 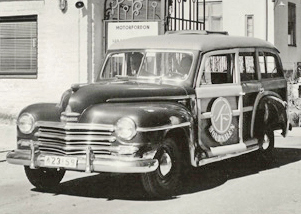 A Plymouth owned by the Swedish film company ”SF” in the forties. PS. How do I add a Swedish "wheel" flag? Hi Ragnar, I agree with you as the proportions of the models are concerned. These deviations from the real one are a mystery. 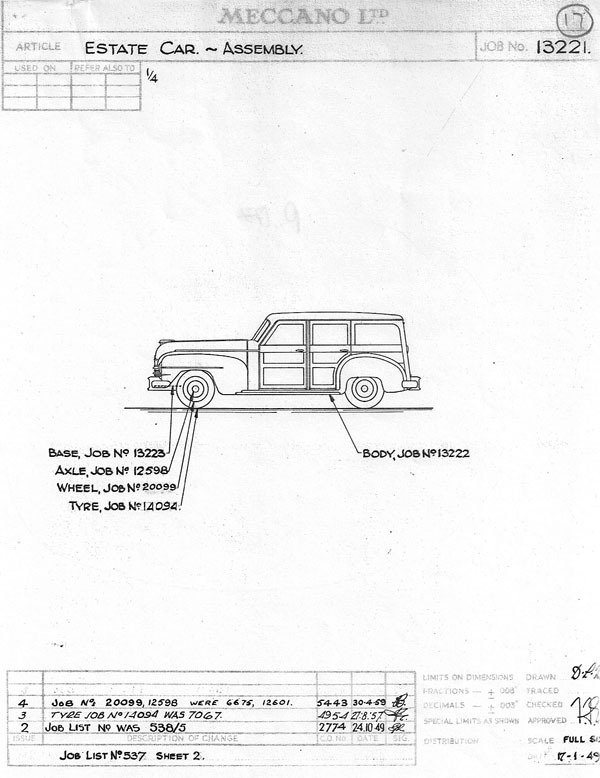 But I believe I can explain the incorrect, very straight back, as opposed to the flowing one of the real car. Hi Jan, interesting theory. 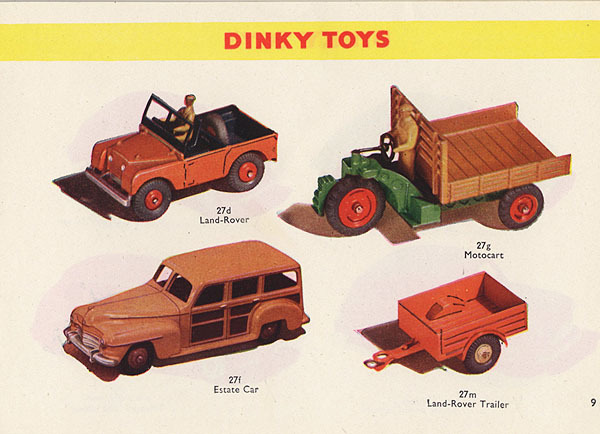 I can also understand why Dinky split the rear bumper to be able to fasten the base plate (as a number plate). A pillar inside would have been visible. I got my Swedish flag . Thanks Jan, Al and Dave! PS. 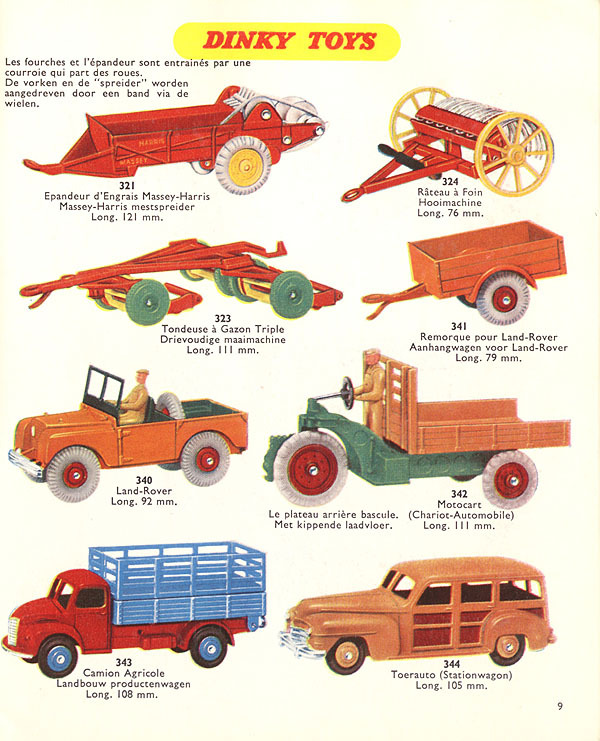 The Plymouth and the 39a Packard were my favourites (sorry for bad image quality). 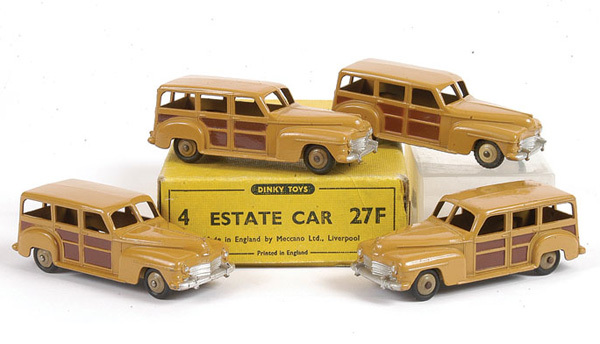 One of these cars, tan with red panels has been sold by Wallis & Wallis in 2008 for £ 440. Unfortunately, I do not have a picture of this model. Is it a colour sample ?